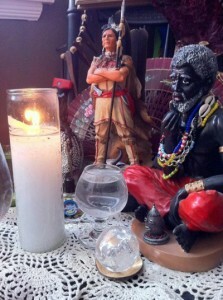 Our bóveda at the Santeria Church of the Orishas where we work with our Ancestors through Espiritismo Cruzado. There are several ways of working with your ancestors within Santería Lucumí. In a previous article we discussed how to work with Ancestors (Egun) through the Traditional Lucumí Ancestral Shrine (opá ikú). In this article we’ll present another common way of working with your Ancestors – through the practices of Espiritismo. Espiritismo is a separate spiritual and religious practice that has was incorporated into Santería in the mid 1900’s. The type of Espiritismo practiced in Santería Lucumí is called Espiritismo Cruzado (Blended Spiritism) because it has been blended or hybridized with African elements from the Congo people. 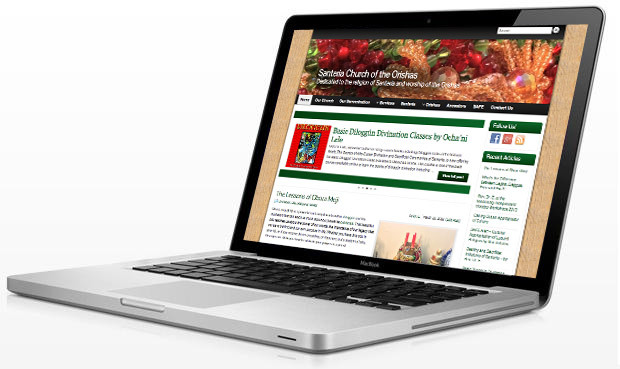 Espiritismo Cruzado focuses its spiritual practices on working with the dead. The dead include both Ancestors of blood and initiation, as well as spirit guides, guardian spirits and elevated masters. Within a Lucumí cosmology, blood and initiatory Ancestors would be called Egun, while the rest would be called Ará Orún, or “citizens of heaven”. While traditional Lucumí ancestral work is pretty limited to working with Egun, Espiritismo Cruzado has a system in place to work with Ará Orún and other non-related spirits. One of the primary goals of Espiritismo Cruzado is spiritual evolution. This includes working toward your own personal spiritual evolution and enlightenment as well as assisting other spirits with their evolution and enlightenment. Espiritistas often work to help spirits that are trapped, addicted, obsessed or dark in vibration to evolve, release their attachments to the physical world and move on to the next stage of their spiritual growth. This work is done by offering prayers, light and service to the spirits. To be clear, ANYONE can work with Espiritismo Cruzado regardless of initiatory status. When working with your Ancestors within Espiritismo Cruzado, you focus on offering prayers, exercising your mediumship skills and communicating with them to tend to their needs, heed their guidance and offer them spiritual energy, that they may return it to you in the form of spiritual assistance, support, enlightenment, spiritual advancement and personal empowerment. You can also pray for your spirits to support you in spiritual work you accomplish like cleansings, blessings, healings, laying on of hands, etc. Your spirits will work through you to facilitate your spiritual goals. Each person has a Spiritual Court – a group of spirits who surround him and work to assist him in life. Some of the spirits are of blood ancestry, but some are not. Some have opted to work with that person, guiding and protecting them through live. Others work with that person specifically on a particular issue and nothing else. Some spirits work through that person for the benefit of others. Every person has a Spirit Guardian that protects their spiritual well being and guards their back. This is why anyone can work through Espiritismo. The central altar and focus of Espiritismo’s practice is called the bóveda (BO-vay-dah – accent on the first syllable). The bóveda is typically a table, shelf or top of a dresser that has been covered with a white sheet or cloth, upon which have been placed 7 stemmed glasses of water. 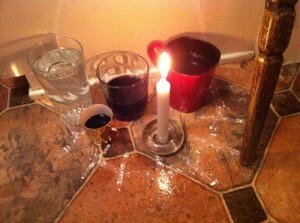 Some lineages use 9 glasses of water, but we utilize 7 in the Santeria Church of the Orishas. One of those seven glasses is larger and taller than the rest and represents the person’s spiritual consciousness as well as the connection to his Spirit Guardian. Some people assign individual glasses specifically to a spirit in their spiritual court. The bóveda typically has a crucifix on it, or inside the central large glass. It is also common to have images of saints, statues, candles, flowers or even doll representing a person’s spirits on it. Anyone can set up a bóveda and begin working with their spirits regardless of initiatory status. You do not have to be a priest to set one up. A person’s work with their spirits is personal and does not require the intervention of a priest or priestess. Statues depicting Indian and Congo spirits, along with fans for Gypsy spirits grace this simple bóveda along with a glass of water, crystal ball and a white candle. A common way of working with your Ancestors at the bóveda is to begin by approaching the altar and lighting a white candle for them. Then put a few dashes of a perfume of your choice, in your hands. Typically Espiritistas will use Florida Water, Colonia 1800, Siete Machos or Colonia Pompeia. Rub your hands together and pass them over their body to pick up any negativity or errant energy, then flick the energy at your bóveda so that your spirits can cleanse you and take it away. The perfumes work not only as an offering of fragrance to your spirits, but the alcohol in them works to feed and nourish your dead spirits so that they can better manifest their energies around you. Once you’ve cleansed your aura begin by praying. There is a heavy Catholic element to Espiritismo Cruzado. The most common prayers are the Lord’s Prayer (Our Father), Hail Mary and Glory Be. Some Espiritistas like to pray from Allan Kardec’s Book of Selected Prayers. It is also nice to burn some incense for your spirits, like Frankincense and Myrrh or Three Kings. Knock on your bóveda three times to greet the spirits. Then take a moment and talk to your spirits. Discuss things that are troubling you or things with which you seek guidance. Then sit in silence and allow your mediumship skills to perceive whatever information your spirits give you. Many Espiritistas report receiving messages in the form of ideas that pop in your head, or imagery that comes to your mind. Others have feelings in their body, or perceives scents. Allow the information to come to you in whatever way it will. You can ask your spirits for clarification. 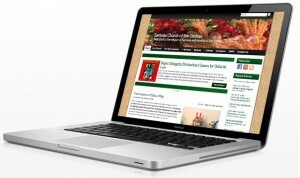 For example if they offer you an image of a car, you can say “I perceive an image of a car. How does this relate to my situation?” and see what your spirits give you. Take as much time as you can, and feel free to repeat any prayers especially after they’ve given you some guidance. Offering a prayer in response to their guidance is akin to offering them spiritual light in compensation for their help. When you are done with your prayers and work, close with another praying of The Lord’s Prayer, Hail Mary and the Glory Be. Knock on the bóveda three times and your work is complete. While some people do offer drinks at the bóveda, strictly speaking this is not proper. Work at the bóveda should be kept spiritual in nature, not physical. Focus on offerings of prayers, candles, light and fragrance. The most physical offering you can do is to blow some cigar smoke on your bóveda, but I personally do not do this. It is always appropriate to offer flowers to the spirits at your bóveda. Coupling your work at the bóveda with your work at the Traditional Lucumí Ancestral Shrine will give you a well-rounded practice for working with your ancestors, keeping your relationship with them strong, and maintaining their support and assistance at all times. 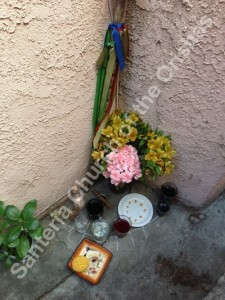 The Lucumí Ancestral Shrine at our church with offerings of food, drinks and cigar. Honoring the Ancestors is of primary importance in all Lucumí rituals and practices. 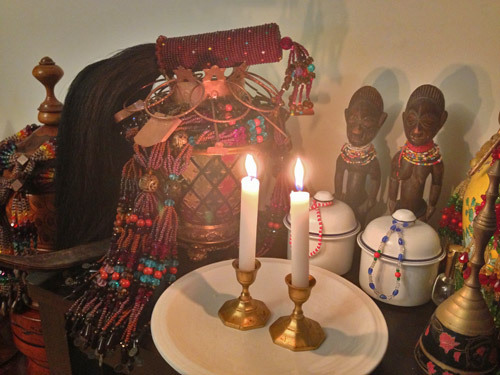 The Ancestors come before the orishas and must be given their due attention and offerings before proceeding with any initiation, ritual or festival. Ancestors are typically honored with food offerings, drinks, flowers, prayers, cigar smoke, libations of water (omí tutu) and coconut as well as other offerings they might like. The Ancestors are known collectively as Egun. Egun includes your ancestors of blood lineage but also ancestors of initiatory lineage. This includes the priests and priestesses who initiated you, your godparents, their godparents and back to the very start of the Lucumí faith. Egun does not include spirit guides like your gypsy spirit. Egun does not include the Seven African Powers. Egun does not include elevated masters like Buddha and Jesus nor does it include saints like St. Michael. These other spirits that are not of your blood or initiatory lineage are called Ará Orún (sometimes mispronounced Ará Onú) – citizens of heaven. They are not propitiated at the Lucumí Ancestral Shrine. They can be propitiated at the bóveda (altar of Espiritismo). For those who were adopted, Egun include the people you never knew that gave birth to you and to whom you are related by blood. In my opinion they also include the family that raised you as they are the ones who supported you and got you to where you are today. The traditional Lucumí Ancestral Shrine, sometimes called “el rinconcito del muerto”, is typically set up on the ground in the corner of a room like the kitchen or bathroom, or placed outdoors against a wall. The Lukumí Ancestral Shrine should be located away from where the orishas are kept, and should be on the ground level of a building to connect it to the earth – where the ancestors are buried. The odd tradition of placing this shrine in the bathroom or kitchen seems to originate from the fact that the pipes in these rooms bury themselves down into the earth, providing a direct connection to the ancestors buried within the land. The traditional Lukumí Ancestral Shrine is typically set up by drawing a circle with chalk or cascarilla (efun) half on the wall and half on the ground. This represents the sun setting in our world but rising in the world of the dead. Typically nine “rays” are drawn on the half of the circle that is drawn on the ground. Within this circle are placed cooked food offerings, drinks, candles and other offerings for the dead. Additionally, the opá ikú (staff of the dead) is leaned against the wall next to this shrine and is used to call upon the dead by tapping it on the ground as prayers are recited in their honor. Some houses also include a terra-cotta tile specially prepared by babalawos with odu painted on it that represent and invoke the spirits of Egun. It is also traditional to include a bundle of nine sticks of the plant mar pacífico (hibiscus) in this shrine, due to the plants connection with spirits of the dead (although some houses use rasca barriga or other plants associated with egun). Some lineages consecrate an otán (stone) as the seat of Egun to place at the shrine but we do not follow this tradition at the Santería Church of the Orishas. 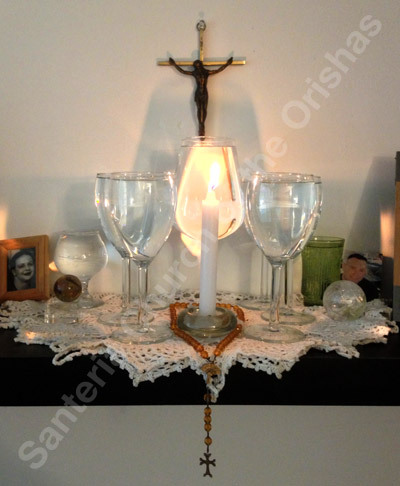 A small Lucumí ancestral shrine with drinks and a candle. It is also nice to place a bouquet of fresh flowers in a vase near the shrine as an offering to the spirits. Flowers are a traditional way of honoring the dead. Some people make the mistake of offering flowers to the orishas, but this is not proper. The odu Osa-Irosun (9-4) clearly indicates that flowers are for the dead, not the orishas. When offerings are left at the Lucumí Ancestral Shrine is is traditional to tap the opá ikú (staff of the dead) on the ground as you recite the Yuba (or Moyuba) to awaken and honor your Egun, and to call them to the meal. Your godparent can give you a Yuba to pray that is associated with your lineage. Calling out the names of your ancestors and offering them praise will let them know you’ve prepared the meal for them. If offerings are being given prior to a ceremony, an Olorisha or Oriaté will then divine with Obí (coconut oracle) to see if Egun gives their permission to proceed with the ceremony. 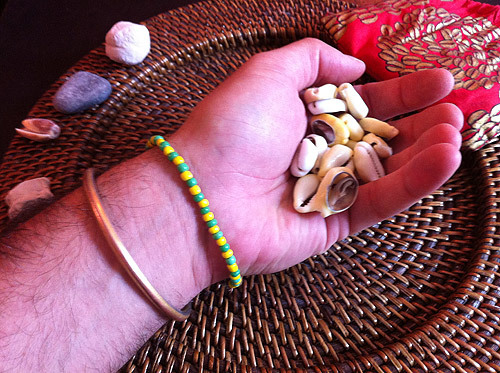 If Egun does not give permission to proceed then the priest will use Obí to determine what is lacking and what Egun needs to give the green light to proceed. Throughout the day, It is traditional to offer the first serving of every dish cooked to Egun by placing a little piece on a plate and setting it out by the Lucumí Ancestral Shrine. When you place offerings at the shrine, they are left until they start to go bad at which point they can be removed and disposed of. It is not uncommon for food or drinks left at the Lucumí Ancestral Shrine to be moldy. It’s the nature of death and most priests will shrug it off and clean it when they get a chance. It’s a good idea to attend to your Egun at the Lucumí Ancestral Shrine about once a week or once a month minimum.